On private water systems, one of the most common causes of pipe and fixture corrosion is from low pH, which can be defined as acidic water with a pH of less than 7.0 pH. Signs of acid water are corrosion of fixtures, blue staining (from copper pipes) or rust staining (from iron pipes). Common causes for acidic water are acid rainfall due to atmospheric carbon dioxide and other airborne pollutants, runoff from mining spoils, and decomposition of plant materials. Corrosion is a natural process involving chemical or electrical degradation of metals in contact with water. Acidic water with pH values in the range of 6 to 7 is more corrosive to the metals used in plumbing systems than alkaline water. Both groundwater (wells) and surface waters (such as spring water or creeks) can be acidic. Acidic waters are typically low in buffering calcium minerals but are high in dissolved carbon dioxide gas, which can cause low pH or acidity. Calcite Neutralizer tanks with natural crushed and screened pure calcium carbonate easily neutralize acidic waters from 6.0 to 6.9. Below 6.0 a blend of calcite and ‘Corosex©” is recommended. What is the flow rate of my well water? If you are experiencing rust staining, test for iron in the untreated well water to determine if the iron is from the well or from inside pipes or water heater. If you are seeing blue or blue-green stains a simple copper test can be done on the untreated water to see if there is copper occurring naturally in the groundwater. This is very unusual and most cases of copper staining are from corrosion of the copper piping. Using the above test results for pH, alkalinity, calcium carbonate hardness, and total dissolved solids, enter the water temperature and these values into a Langelier Saturation Index calculator and see if the water is corrosive or not. A negative number of less than 0 indicates the water is corrosive. Generally, the lower the pH, the lower the hardness and alkalinity, and the higher the total dissolved solids will mean the water is more corrosive. Unless your toilet tank is new or has recently been cleaned your toilet flush tank can be a wealth of useful water quality information! Simply lift the cover and look in. If you see blue stains, or blue-green deposits this indicates copper pipe corrosion. If you see rust stains or rust deposits this can indicate iron pipe corrosion or there may be iron naturally occurring. If you see rust stains or rust deposits this can indicate iron pipe corrosion or there may be iron naturally occurring your well water. A toilet tank check combined with a water analysis gives you a good idea of what is occurring in your pipes and fixtures. Check for signs of blue stains in fixtures, blue stains in toilet tanks, which can indicate copper corrosion, and/or test water for copper. If you have galvanized iron pipe, look for signs of rust and rust-colored scale in the toilet flush tank. If possible, inspect the exterior of pipes and valves, to see if you see any signs of pinhole leaks or corrosion byproducts which can be crusty, bluish, white or salty looking or rusty. If you are having any plumbing work done on your house, inspect any sections of the pipes that have been cut to see if there is any scale build up or signs of corrosion. neutralizer that has 1″ pipe connectors. Knowing what size piping you have solves this problem. your pipe size. Circumference is the distance it takes to go around the pipe once. Remove any insulation from the pipe. Using a piece of string about 6″ long (or a cloth tape measure) wrap the string around the pipe once and measure to the nearest 1/8 of an inch. Once you have found the circumference, use the chart below to find your pipe or tube size. Your well pump can pump water up to a certain maximum flow rate, in gallons per minute. For example, say you could fill a 5 gallon in 1 minute. This is a flow rate of 5 gallons per minute or 5 GPM. If the water filled up a 5-gallon bucket in 30 seconds, the flow rate would be 10 GPM. 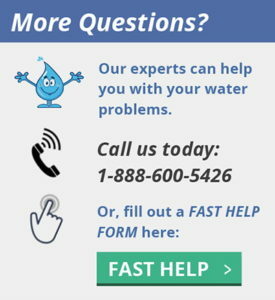 Knowing how many gallons per minute your water system can pump is critical to picking the right type of water treatment system, and it is easy to determine. This method works for most well pumps. If your pump turns on at one pressure (typically 30 or 40 PSI) and off at a higher pressure (usually 50 or 60 PSI) this method will work for you. 1. Open any hose bib or faucet until pump turns on. 2. Close hose bib or faucet and let pump fill up pressure tank until it turns off. 5. When the pump turns off, record pump cycle time to refill pressure tank in seconds. 6. Divide the number of gallons collected in Step 3 by the number of seconds in Step 5. 7. Multiply the answer from Step 6 by 60. 8. The answer in Step 7 is the average pumping capacity of the pump in gallons per minute (GPM). Click this link to our online calculator to make your calculations quicker and easier. One of the most convenient methods to raise pH, hardness, and alkalinity is to use a calcite neutralizer filter. These filters will typically raise the pH of the water to 7.0 to 8.0 and add 30 to 100 ppm of hardness depending on the alkalinity and water hardness. In neutralizer filters, acidic waters slowly dissolve the calcium and magnesium media on contact as the water flows through the filter, raising the pH of the water and increasing the alkalinity. This eliminates the effects of corrosive water chemistries and can help to prevent corrosion of piping and fixtures. The size of the system is directly proportional to the flow rate of the water, in gallons per minute. The higher the flow rate, the larger the system required. This eliminates the effects of corrosive water chemistries and can help to prevent corrosion of piping and fixtures. The size of the system is directly proportional to the flow rate of the water, in gallons per minute. The higher the flow rate, the larger the system required. 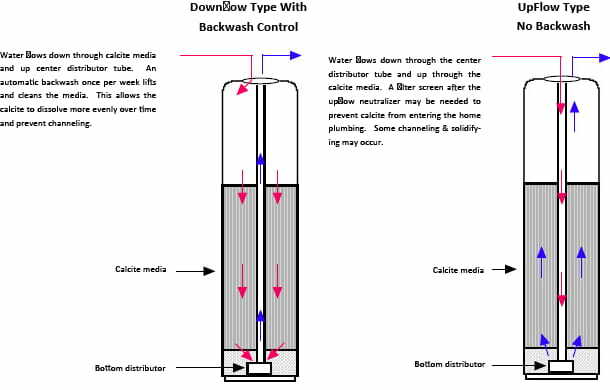 Both upflow and downflow neutralizers are used, but generally, downflow neutralizers that have a periodic automatic backwash are much easier to maintain and tend to work better for residential well water systems. If the pH of the water is 5.0 to 6.9 and the calcium hardness is less than 150 ppm, generally the calcite neutralizers are preferable for most homeowners. A once per year addition of the calcite is all that is typically required. The soda ash feeders require new solution added every 3—6 months. 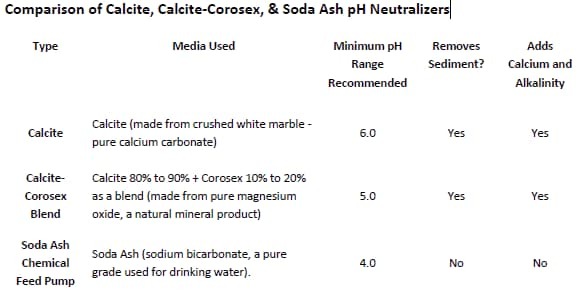 However, if the pH is 5.0 or less, a soda ash feeder is preferable because a calcite neutralizer might not raise the pH to the 7.0 on a consistent basis. When the pH is less than 5.0, the amount of calcium and magnesium required from a calcite neutralizer might make the water too high in hardness, requiring a water softener, so a soda ash feeder works better. A. The calcite and calcite-blend neutralizers work by adding calcium to the water, and it will increase the calcium hardness of the water, making the water ‘harder’. However, most acidic well water is soft, to begin with, and after passing through the neutralizer, will be harder, but shall not hard enough to warrant a water softener.Q. Will calcite (or calcite‐blend) neutralizers make the water so hard that a water softener is needed? Generally, if the water is less than 170 mg/L or 10 grains per gallon, most customers can avoid having to use a water softener. If your water is 3 grains/gallon, to begin with, after the neutralizer it might be 5 to 7 grains per gallon, as the neutralizers will add 3-4 grains per gallon on average. You can always add a water softener later if you find you want one, but we generally do not recommend a water softener be installed. If you are having white spotting on fixtures and you want a water softener, you could install them both at the same time, but its better for the elimination of copper corrosion, if you wait 3-6 months to give the neutralizer a chance to stop the copper corrosion before adding the water softener. For home wells, the soda ash metering pumps are wired to turn on and start pumping soda ash solution, when the well pump turns on and off. In this case, the injection point of the soda ash solution is before the well pressure tank. 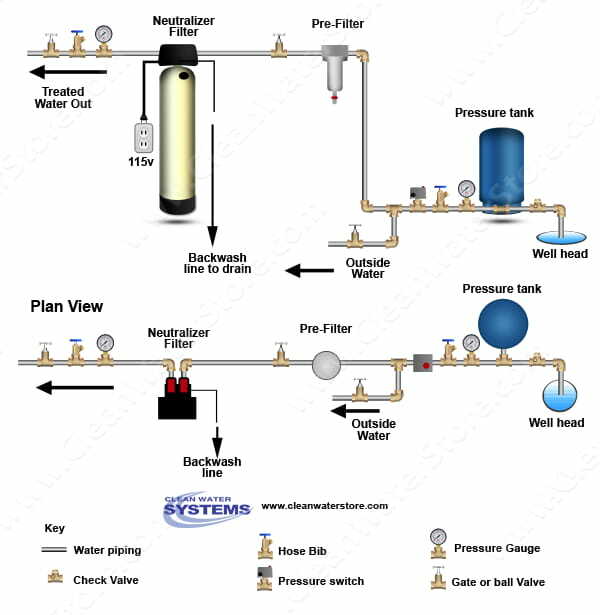 If the soda ash injection point is after the pressure tank, a proportional system is used. A flow meter controls the metering pump and controls the metering pump proportional to the flow of the water. Soda ash is a powder that is mixed with water to form a saturated solution. You can make the solution stronger or weaker. To start out, mix 4 lbs of soda ash powder to five gallons of hot (or at least warm) soft or purified water, which is approximately a 10% solution by weight. It is best to use purified distilled or reverse osmosis water or softened water to make up your solution, although if your untreated well water is very low in total dissolved solids and other minerals, you can use the untreated water to make up the solution. Inject this soda ash solution at a rate of 100 – 200 PPM and adjust output of metering pump and/or soda solution strength to achieve the desired pH level. Inject this soda ash solution at a rate of 100 – 200 PPM and adjust output of metering pump and/or soda solution strength to achieve the desired pH level. After mixing, some of the soda ash powder may settle to the bottom of the solution tank. Soda Ash Injection controlled by the existing well pressure switch. The most common method used is this method and is the lowest cost.